The Concept Eight is not about cramming in half an hours work on the way to and from the airport, It is a car that exudes British good taste and calmness. It has a very relaxed but contemporary feel about it. Jaguar is not an all work and no play company and the Concept Eight reflects that. When you ride in it you should get the same feeling of well-being that you would enjoy if you stayed in the latest trendsetting hotel." Julian Thomson, Chief of Advanced Design, Jaguar Cars. 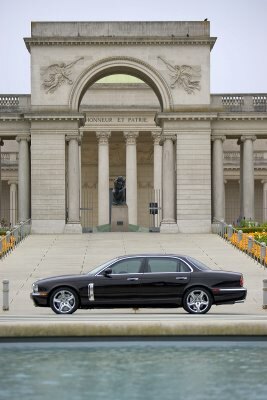 The launch of the New XJ Long Wheelbase marks not just the return of the seminal luxury British saloon but also an opportunity for Jaguar Cars Advanced Design Studio to use the most spacious vehicle the company has ever built as the base for an intriguing design programme  the Jaguar Concept Eight. This sumptuous luxury saloon blends the best in contemporary British creativity with the ultimate in automotive engineering to offer a compelling glimpse of future Jaguars. The Concept Eight has been designed to reflect the unique position that Jaguar holds in the luxury car market. 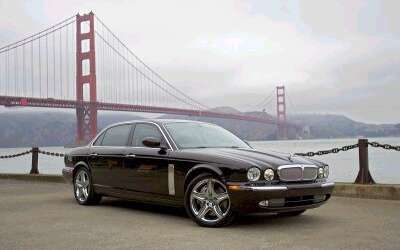 Developed from the New XJ Long Wheelbase saloon, it has been extensively reworked beneath its broad, single-piece, glass roof to produce a luxury concept car that is understated and tasteful, yet powerful, exciting and undeniably glamorous. Making the most of Jaguar's New XJ Long Wheelbase structure  with the longest wheelbase in its class - the Concept Eight introduces new luxury elements, new in-car entertainment technology, and new performance styling cues. British design is acknowledged to be world-leading in creative areas as diverse as fashion and architecture, interiors and furniture making. The Concept Eight reflects Britains standing in design by using the most contemporary materials and trim to create an environment that is unlike any other luxury saloon. You wont find lap-top computers, satellite uplinks and plasma screens inside the Concept Eight, instead you will enter a world of inch-deep handmade carpets, chilled champagne, Waterford Crystal and even essential oils to allow you to sit back, relax and enjoy the ride. The Concept Eights exterior appearance has also been given considerable thought  and nowhere is that more apparent than its roof. The lightweight aluminium skin that stretches across the cars upper surface has been replaced with a single, full-length piece of darkened glass to provide an even greater feeling of spaciousness within. Around the edges of the glass panel a strip of LED lighting provides an ambient red glow that equates with the mood lighting that you might find in a fashionable bar. 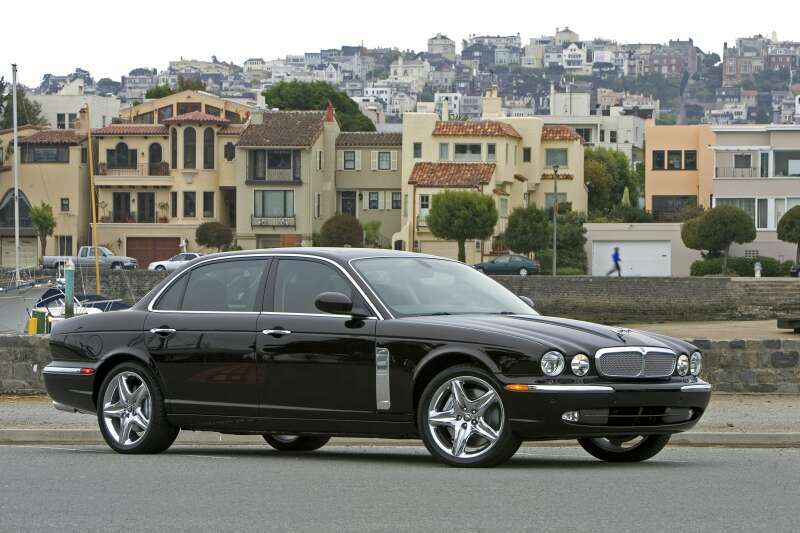 Between the rear seats runs a centre console that extends all the way to the front of the cabin  an evolution of a similar design first seen in the Jaguar R Coupe concept car. This clean, sweeping section is covered with a well-recognised wood veneer  American walnut. But unlike existing Jaguar interiors, the concept cars walnut trim has a matt finish. Warm and smooth to the touch, it is a 21st century spin that Ian Callum says indicates how future Jaguars could both look and feel. The power-adjustable, reclining rear lounge seats are wrapped in aniline leather  as is the upper instrument panel  demonstrating all the natural markings inherent in a raw material. The lower instrument panel, console, and lower door casings are all trimmed in nubuck, a soft leather that has been gently buffed on the grain side to give a velvety surface. Conker, the dominant rich, brown colour, takes its name from the seed of the Horse Chestnut tree that is indigenous to the British Isles. Jonathan Connolly is the sole provider of the Conker leather, providing a rich textural mix with accents provided by chrome gloss and aluminium. The combined effect is one of warmth, comfort and sophistication. To further create a feeling of space and light, an ivory-coloured leather covers the roof pillars and head-lining. Its not just materials that give its interior such a sense of modernity and luxury  the Concept Eight also contains hidden extras designed to surprise and delight. 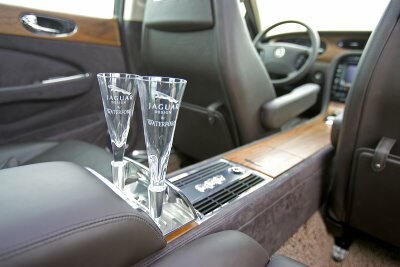 Built into the centre console is a refrigerated compartment that holds a chilled bottle of Mumm champagne and two specially designed Waterford Crystal glasses in an aluminium holder. To cater for the unique design of the glasses  they are champagne flutes without bases  a bespoke drawer is built in ahead of the fridge in which to stand them without spilling a drop. The pampering continues inside two cabinets hidden in the rear of the front seats, which contain luxury items such as essential oils and perfumes, a digital camera for recording the highlights of your evening and even a writing set. The two-way front speaker set-up is complemented by a centre fill speaker located in the middle of the dash. The rear compartment has also been extensively remodelled to incorporate additional mid speakers in the rear shelf while increased diameter subwoofers provide a stirring deep bass sensation. The Jaguars rear doors also feature the latest DDLinear drivers and soft dome tweeters. As featured on current Alpine Jaguar Premium Sound Systems, time alignment means all occupants receive the sounds at precisely the right moment, wherever they are seated. The Concept Eight shares the same 3159mm wheelbase as the New XJ Long Wheelbase  125mm longer than the standard wheelbase XJ version. But despite that extra length, the driver and passengers will sacrifice nothing in terms of the class-leading dynamics and technologies found across the XJ range. Its ground-breaking aluminium chassis and bodyshell technology mean that straightline performance and handling are uncompromised, while the Concept Eights use of the 400bhp 4.2-litre supercharged AJ-V8 engine guarantees a blend of crushing acceleration and effortless cruising.